ANNOUNCING NEW HOURS STARTING MAY 1! Click here to see our archive of instrument demo videos, and don't forget to subscribe! Since 1982, Dusty Strings Music Store has been a gathering place for instrument players and music lovers. 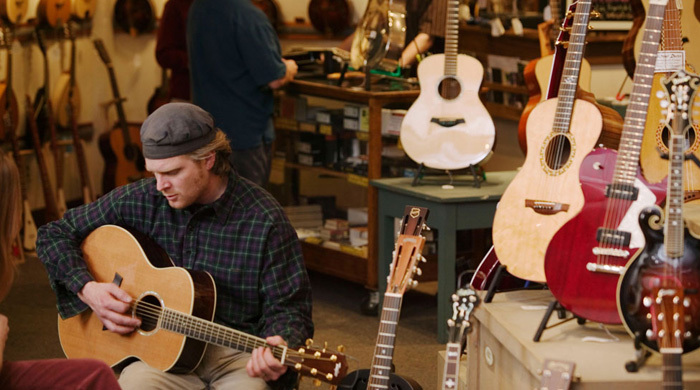 Come explore new, used, rare, and vintage acoustic guitars, electric guitars and pedals, mandolins, ukuleles, banjos, harps, hammered dulcimers, and accessories -- all within reach and ready for you to play! We are an authorized warranty repair shop for both Martin Guitars and Taylor Guitars and carry such builders as Martin, Taylor, Collings, Goodall, Deering, OME, Weber, National, Fano, Nash, Silvertone, G&L, Tone King, Vox, and more. Our school offers private lessons, group lessons, concerts, and special events. Come play music! Seattle musician and Dusty Strings Music School teacher Eric Madis demos a new Collings C10 with a stunning doghair finish on the mahogany back and sides. The top is sitka spruce with a solid black finish. A pearloid pickguard and headstock overlay perfectly compliment this incredible small bodied masterpiece. Come on in and try it for yourself!